Design Research. Systems Design. Urban Design. 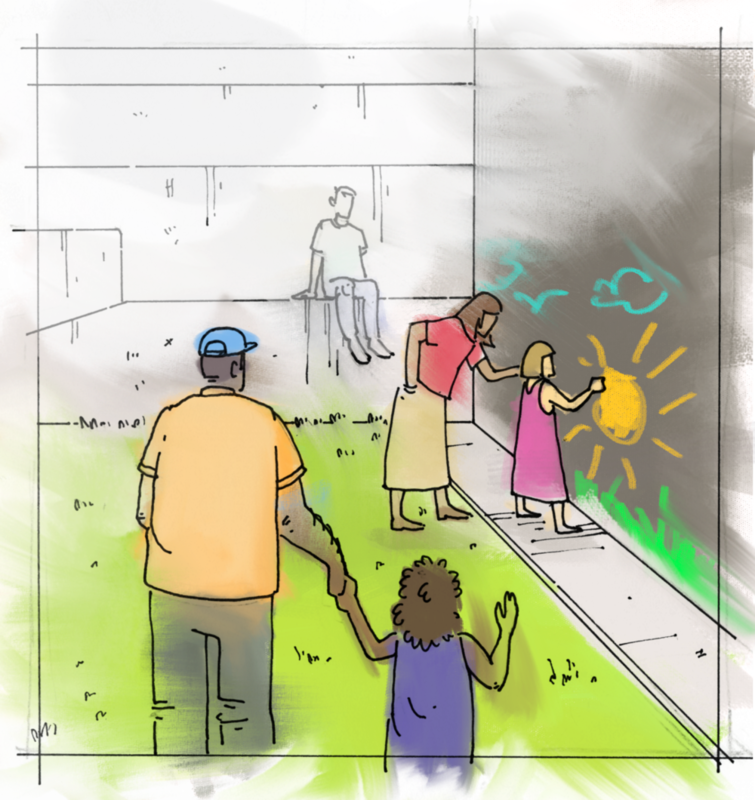 This was a community design project where we had the opportunity to work with the Hill District neighborhood in Pittsburgh to come up with ideas to revitalize an abandoned outdoor space. Through a rigorous research and prototyping process, we created a plan to pass off to the city developers that outlined the activity programming and its corresponding urban design that would be beneficial to the growth of the neighborhood as a whole. Our full research blog can be found here. This was a semester long collaborative project with Benjamin Boesel, Gina Huang, Solomon Ng, and Jessica Shen. Special thanks also goes out to Terri Baltimore at the Hill House and Jamilah Lahijuddin with the Youth Organizers Group. 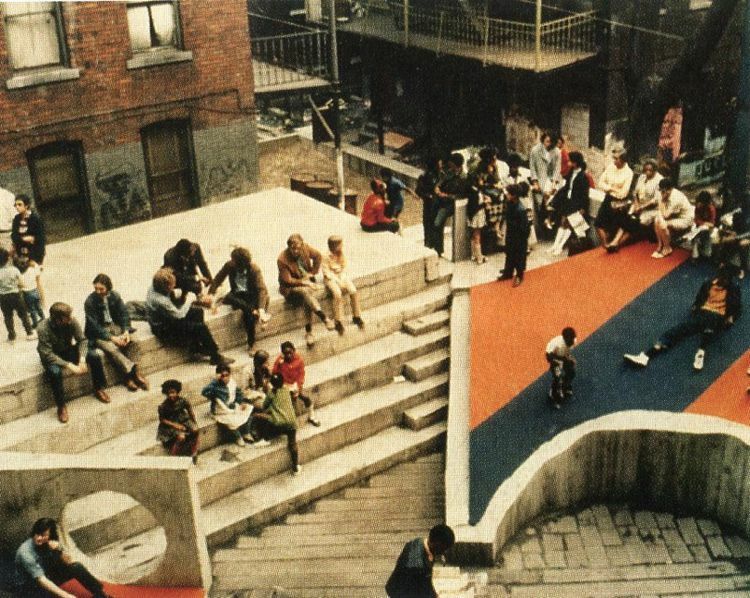 The Court of Ideas was a courtyard behind the New Granada Theater that served as a community gathering place. 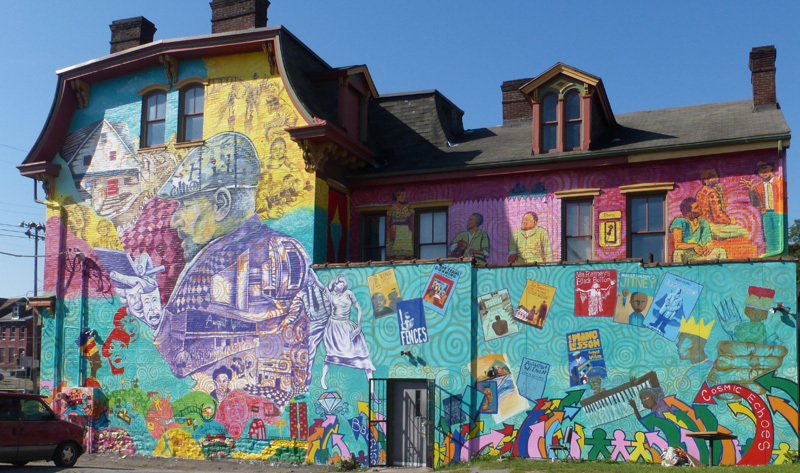 It was unofficially established by Troy West, a professor at Carnegie Mellon University, Carnegie Mellon architecture students, and young residents of the Hill District. It brought together people from all over Pittsburgh and contained murals, a performance space, and seating areas. The remnants of these pieces are still there. However, the space has since then come out of use, and is now once again an empty lot. It was forgotten for a while until it was rediscovered in the past few years. To establish a space most fit for the Hill District, we reached out to several community members and researched the plans for the Hill District to establish goals, find inspirations, and understand community values. We were introduced to the Court of Ideas by Terri Baltimore, and got interested in revitalizing the space. Throughout this project, we’ve explored and gotten to know the Hill District and its community members. We looked at the Hill District Master Plan and the Centre Ave. Master Plan for more insight into upcoming developments. We gathered several takeaways, most notably the Hill District’s emphasis on its history, new initiatives for less vacancy and more green space. We wanted to hear ideas from residents of the Hill, so we put up posters in various locations: the Hill House Association, the Library, and the Grayson After School program. These posters had a space for anyone to write and draw what they wanted to see in the new Court of Ideas. They wrote down a lot of fun ideas, ranging from things like movies and music to ice rinks. After working with the Grayson Center, we did an activity with the Youth Organizers to get more ideas. We asked them about what activities they thought could be in the space and what sorts of things they’d like in the community in general. We organized their favorite ideas into these four general categories of performance, education, dynamic open space, and public art. Throughout this process, we were exploring the Hill and keeping in conversation with Terri and Jamilah from the Youth Organizers. 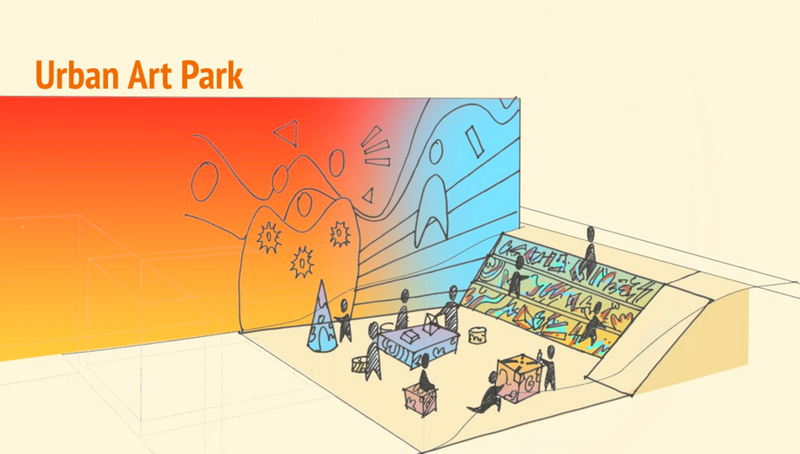 We began to see murals playing a big part in our space, and started thinking about how community members could be involved in the process of making public art in a less formal way. We looked at several ways of getting the community to be involved in the space. While the master plan provided spaces for larger businesses, it has the potential to push out smaller businesses in the hill. As an open lot, the Court of Ideas can a provide a space for sustainable local businesses like food vendors and independent artists. There also seems to be a large push to making the hill district a much greener area. We took a look at initiatives like the Curtain Call, and Walter Hood’s Greenprint plan. Some other things that we picked up along the way were the importance of meeting spaces in the area, and the different age groups related to them. We wanted our space to celebrate the past and promote the future by catering to both young and old. After speaking to Mary Monaghan at the Carnegie Library, we learned how places like the library provided a space for children and younger members of the community to just be themselves without any expectations. We did some rough sketches to explore how these principles could be built into a public space- to see what the possibilities were. For example, what type of things could make up an art space- are there chalkboards, murals or art sculptures? 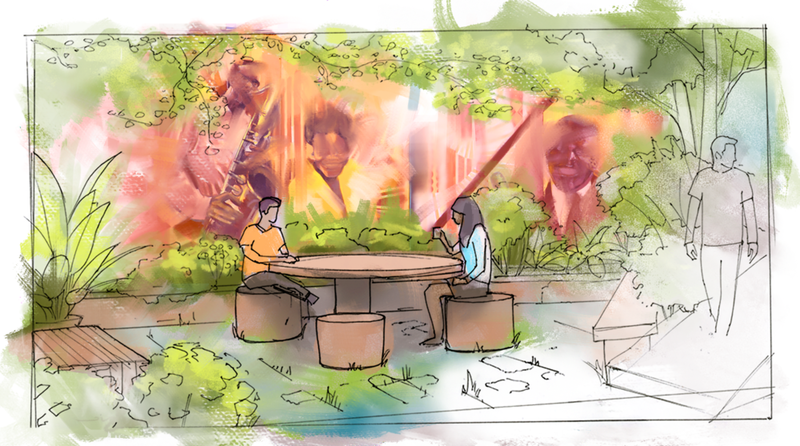 What would an outdoor classroom look like, and how could that be a part of a multipurpose space? 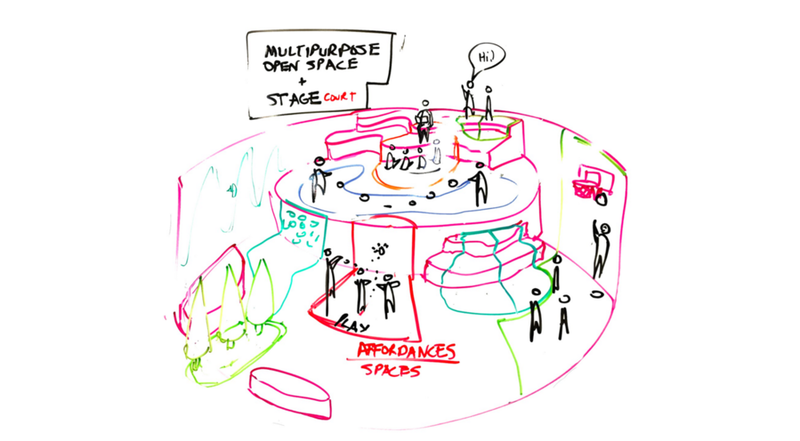 How can we merge these principles into one comprehensive space, creating a multipurpose space that supports activities of learning, play, and music? We cleaned up our drawings and speculations, exploring in depth what could potentially fit in this space, how we could use the topography of the hill to our advantage, and how to combine combine art and greenspace in a complementary way. 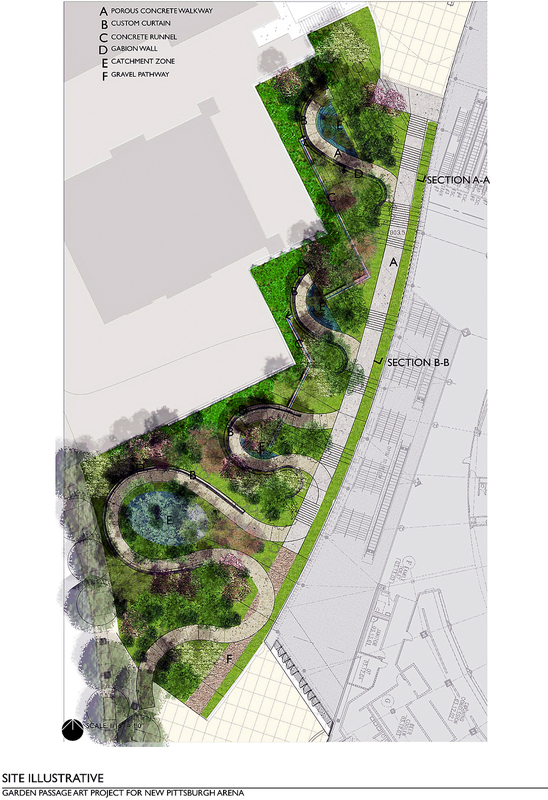 To get a better understanding of the physical space and landscape design, we also spoke to Joshua Welsh, a landscape designer with some experience in the Hill. Overall, we received very positive feedback on our design. One of the members of the Consensus Group mentioned that there might be greater considerations for safety, and how to design a park in a way that promotes security. It was also emphasized that the programming for this area was extremely important . Terri also mentioned how Hill District residents might be able to take ownership of the Court of Ideas. 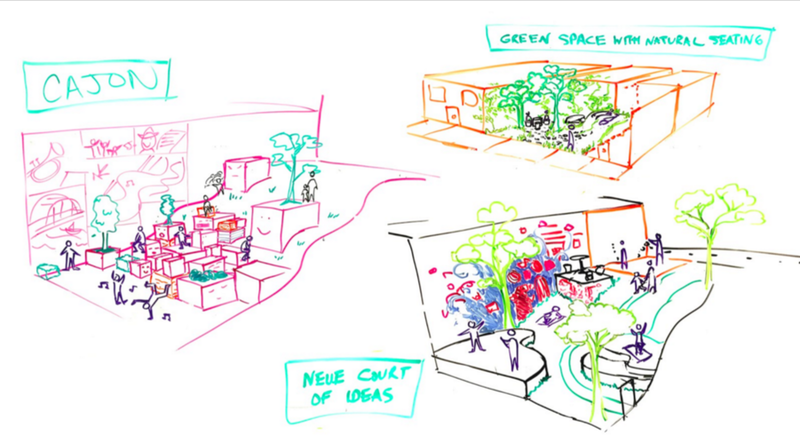 Striking the balance between open ended spaces for many activities and more structured spaces was our next focus. We incorporated this thinking into the revision of our design. To incorporate the feedback we received from the consensus group meeting, we revisited our programming and thought about how to make the space more versatile. Safety was another big concern for us, and we wanted to create as much openness as possible. This culminated in a more “realistic” version of our original design, that stays true to the original concept of a crossroads. We also saw it as an intersection of past, present, and future. There is a lot of history that needs to be celebrated, but there’s also a lot of new things happening in the hill that should be recognized as well. The Hill lives at the intersection of major neighborhoods in Pittsburgh, and we saw the opportunity to use the Court of Ideas to pull people together from the surrounding neighborhoods, the same way the old Court of Ideas was also a hub of diversity back in its heyday. Using the Centre Ave. Master Plan as another inspiration, we hoped that this design would be able to fit in with the Hill’s vision of their future. There are a multitude of lights that allow for activity after dark as well, creating a more lively, safe space. The space is designed with minimal visual obstacles, so residents will be able to keep watch and observe the entirety of the space from any vantage point. The Court of Ideas provides a space for food and commerce at the top of the slope, at street level. By providing the space and necessary parts (seating, open areas, etc. ), local vendors have a better space for their businesses, fostering a better economy within the Hill District. 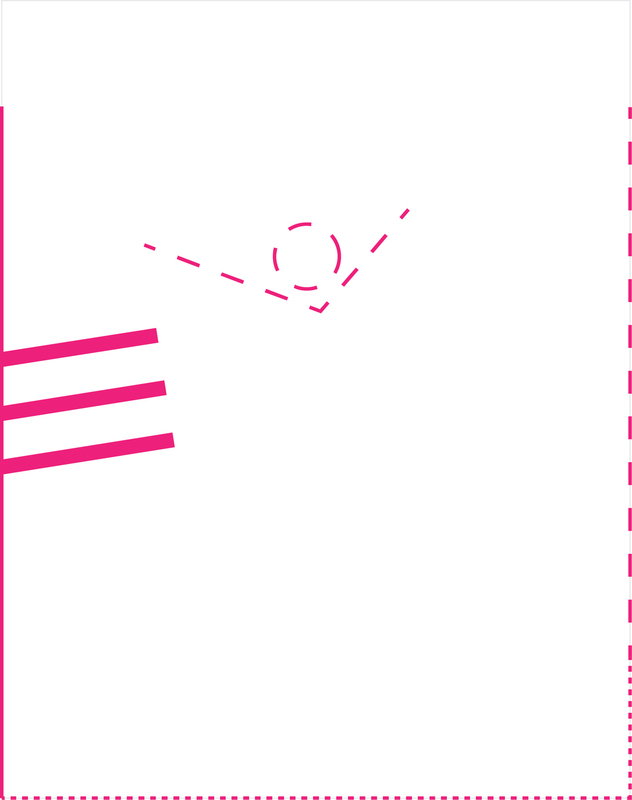 The Court of Ideas redesign was created with the the arts and education in mind. We made several affordances for different types of art, from murals and sculptures to music, and from permanent to temporary. The space contains several spaces available for different types of murals. On the side of the new Granada, there is space for a permanent mural, where the previous mural used to be. On the side of the new building, there is potential for semi-permanent murals, and in the front, a space for very temporary art with a chalkboard wall. At the top of the Court of is a space for a potential sculpture or art piece. Inspired by the temporary structures that existed by the Court of Ideas in the past, this space provides an opportunity to house any kind of art piece. While spring, fall, and summer can provide good weather for many outdoor activities, winter often causes parks to shut down and remain unused. To increase more use within the space, the community can participate in activities and decorating that can make the space more inviting. Similar to seasonal planting, the community can participate in seasonal decorating for the holidays or any seasons. Students and organizations can be involved by contributing to their own decorations or participating in decorating, encouraging a feeling of a community front yard or living space. 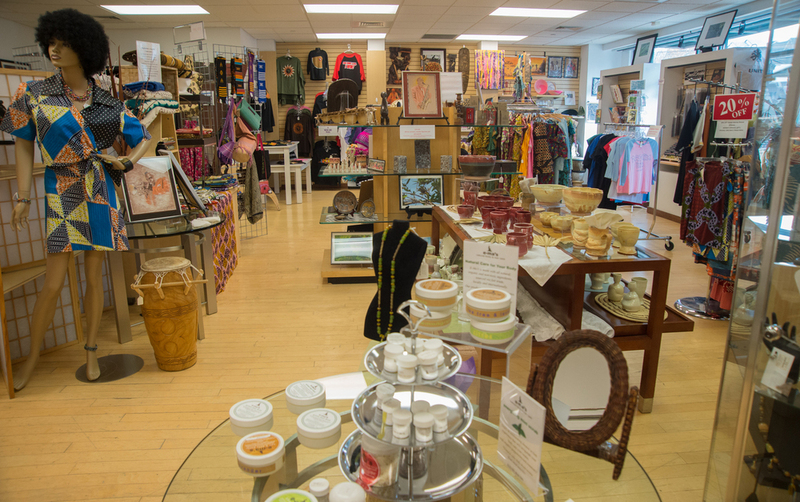 The space is primarily focused on bringing the community together. 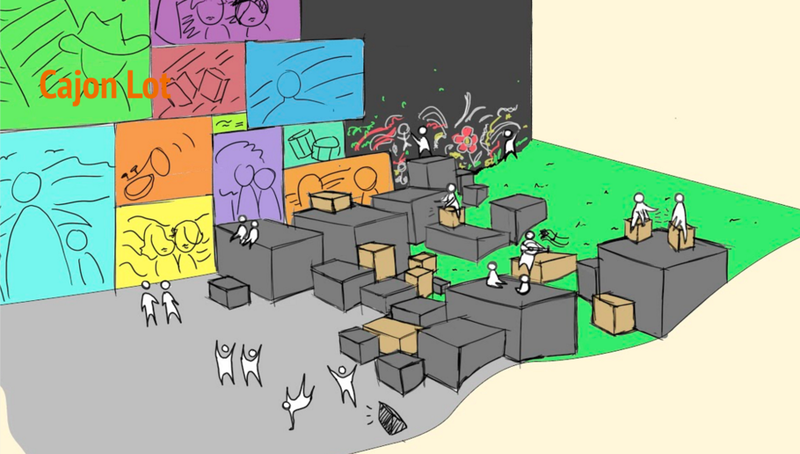 Aside from the aforementioned spaces, there can be other community sponsored activities: Organizations and clubs can organize meetings at the court of ideas, bringing activities more open to the public, for example: Chess clubs, yoga, reading circles, etc. In good weather, movies can be projected across from the steps for safe, night-time community events. The community can participate in replanting and maintenance of the greenery in the space by planning annual plantings. This can be implemented either through an organization, or even through classes teaching gardening, or teaching children the life cycles of plants.